Which version of QuickBooks Online is right for your clients? QuickBooks Online is available in three progressive versions, each level at a different cost, but more importantly, with more features than the previous level. Knowing which version suits your small business client all depends on what they need and the core features that will help them run their business. The three versions are Simple Start, Essentials and Plus. Do they need to track accounts payables (Bills)? Will they need to send out the same recurring invoice? How many employees in the business need to be managed through payroll? Is budgeting important for the business? Do they need foreign currency transactions? Will they need to track different departments or jobs? Will time tracking will be useful for them? Will they need to complete quotes on the run? It’s important to understand which version of QuickBooks Online is right for you and your client. 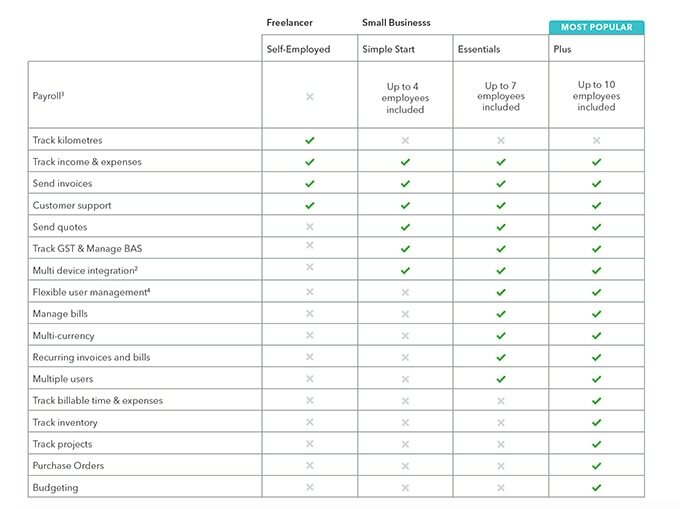 While each version offers a number of core benefits, the list of core features increases as you upgrade your plan. Here’s a quick breakdown to understand the main differences. I recommend Simple Start to start-up businesses, that may need to send out invoices, pay their expenses and manage their BAS. It is also a great option for sole traders, especially tradies on the go who need to quote from their iPads. Popular industries that use Simple Start include hairdressers, new-start tradies and natural therapies that consult on different services. NOTE: Simple Start will not track your Accounts Payable (Bills) nor does it have the ABA payment function. Essentials is great for businesses that have grown to a stage where they have heavy accounts payable and need more users in the file such as accounts and sales people. This version includes all the features of Simple Start and is available for 3 users in the file at the same time. Essentials is a great option for cafes that need to track and manage bills and setup ABA files, in order to save them time when paying suppliers in bulk. Property entities also use recurring invoices for their monthly rent coming in. The multiple currency feature can also be turned on for clients that need to invoice out in other currencies. NOTE: Essentials will not track inventory nor help you run your budgets. The Plus version of QuickBooks is the most comprehensive and offers the most features. Large construction industry clients will need the Plus version, so they can use the tracking feature of Classes and Locations. You can also set up budgeting under the customer to monitor quotes on larger jobs. Clients sending out purchase orders will also need to use the Plus version. We often recommend the Plus version to franchisors so they can utilise the inventory feature. Advisors using QuickBooks Online Accountant can choose to own and manage their client subscription under exclusive wholesale pricing discounts, by subscribing to client files within the product. When taking up 5 or more files, an advisor can redeem online bundle discounts, priced up to 50% less than the client’s regular retail price, by speaking to their account manager or visiting Intuit Global. QuickBooks is cloud-based and accessed through all your devices with an internet connection globally. Can I upgrade or change plans? Yes, you can change plans and upgrade, but you cannot downgrade your plan. Can I bring my data across from my old software? Yes, definitely you can convert your data into your new QuickBooks Essentials and Plus version from Xero, MYOB and Reckon. NOTE: you cannot run a conversion into the Simple Start version. What if I need more employees in my plan? Are there special offers for advisors? Yes, if you’re not an advisor contact 1800 618 521 to discuss how you can become a QuickBooks Advisor today.